Happy Chinese New Year 2013 - The Year of the Snake! Chinese New Year celebrations begin today. 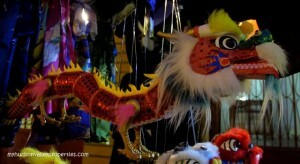 Historically it reflects the Lunar New Year, but in the western culture it has become linked to the Chinese holiday. Korean, Tibetan and Vietnamese people to name a few also have their own festivities. Celebrations began last week and go for another ten days. Is there something in your area happening? In Newburgh I found that Yobo Restaurant is having a Chinese Dragon Show today. Something tells me that I should make plans early. I am already getting hungry. Newburgh NY is 65 miles north of New York City. A short train ride away and you can visit Chinatown. Celebrations begin today and go all week. Check out the NYC Parade and Festival on February 17th at 1pm. 2013. My photo above is from a recent trip to Chinatown in NYC. I was at a small shop and saw this beautiful ornate puppet hanging in the store. Although not quite time for the New Year celebrations, my dragon would be popular for small children during while the festivities are happening. He was quite beautiful and found his way into my camera lens. Did you know that 2013 is the Year of the Snake. Anyone born during this time is thought to have a strong personality, be witty, wise and a great thinker. What is your sign in the Chinese Zodiac? Mine is the year of the horse.